When Head Coach David Cutcliffe came to Durham, he vowed that he would transform the Blue Devils into a faster and more athletic team. In his first few recruiting classes, he has added several elite athletes, including Isaac Blakeney in 2010 and Jamison Crowder in 2011. The coaching staff is looking to continue that trend in the class of 2012, and Duke is one of the first two schools to offer a top athlete from Texas. Dontonio Jordan is a 5’11” 183 pound athlete from Corinth, Texas. 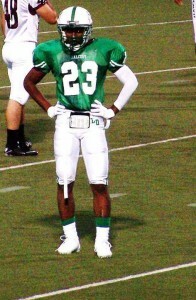 His great speed and quickness have allowed him to play both receiver and running back for Lake Dallas High School. Highlights from his junior season can be viewed here. Running back, that’s really my natural position. That’s where I played until I was a freshman, and then we had like 4 or 5 good running backs my sophomore year in high school, so they decided that playing receiver would be the best position for me at that time, for sophomore year. Junior year – last year – I got a little bit more running back carries, averaged 6.7 yards per carry, and about the same amount or receptions, but a lot more yards and I had 10 more touchdowns than I did the year before, so that was a good improvement. BDN: You said you feel like running back is your natural position, is that where you want to play in college and what position have college coaches been talking to you about playing? College are considering me as an inside receiver, because that’s all they’re really seen me as, as of right now. But after this year, because I think running back is more my natural position, I think I’m going to have a big year at running back this year and more colleges will be looking at me for that also. Me and my dad, my dad helps me out a lot. We go to the track probably every Sunday, we’re probably going out there later today. We go every Sunday and work on footwork drills and lateral movement. I still work on my route running and stuff, too, and I’m also lifting a lot of weights, when I can lift on weekends, on Saturdays with my dad also. I do push-ups at home, and stuff like that. I go to a camp every Tuesday and Thursday, I go to this thing called Velocity, where we do a lot of core training to get your core stronger, balance, 40 [yard dash] times, all types of stuff like that. Last year we had kind of a disappointment. We should have won easily to at least the fourth round of the playoffs, but we lost in the first round, just a couple of muffed punts and stuff like that. Next year, for me personally, I think I should have a 1,000 yard rushing season and about 700 yards receiving at least. I think our team, we have a lot of returning starters – we have 9 on offense and probably about 5 or 6 on defense – so we have a lot of experience and we have a lot more depth, so I think we should be able to go to at least the 4th round and face [defending state champion] Aledo [High School]. My top three things that I would look for is the proximity to home, and if I’m not close to home, say if I’m in North Carolina or California or somewhere like that, then how “homey” is it? Do I feel like it’s home to me? And early playing time is one of my top three also, and good coaching. All the coaches that I’ve talked to, most of them, I get a good vibe off of, and I like that I can build a relationship with the coaches. BDN: I know we mentioned that Duke is one of the schools that has offered you. Which schools have you in contact with the most, and which schools have extended verbal offers? Stanford is the only other offer that I have as of right now. I’m getting a lot of calls from people saying they’re coming to see me this spring, they want to evaluate me more, but they say an offer is on the way. Some other schools are saying that if I get my transcripts to them then I’ll get an offer. Schools like Tulsa, UConn, Baylor, Iowa, and Michigan State. Those are really the ones that I talk to the most often. As of right now, I think it’s almost set in stone that we’re visiting Stanford on May 14. Duke, I think we’re going to try to make a fall visit there. UConn, they’re trying to get me out there we just don’t know when. I’ve already visited Baylor, that was my first visit actually. I went to SMU yesterday. Iowa’s been trying to get me out there, but it’s really just all going to come down to my official visits, really. BDN: So it sounds like you want to take some official visits this fall and make a decision after your season, is that right? BDN: Is there anything else that you think college football fans should know about you? You know, I’m just a regular guy, nothing out of the normal about me. BDN: Well it certainly sounds like you’re a hard worker and I just want to wish you best of luck with your recruitment. Thanks a lot, Dontonio.